Every year Matrix brings together all of their educators from around the globe to teach, inspire, and encourage working hairdressers over the course of a 3-day extravaganza. This hair nerd party is called Matrix Destination, and this year it took place in Orlando, Florida. 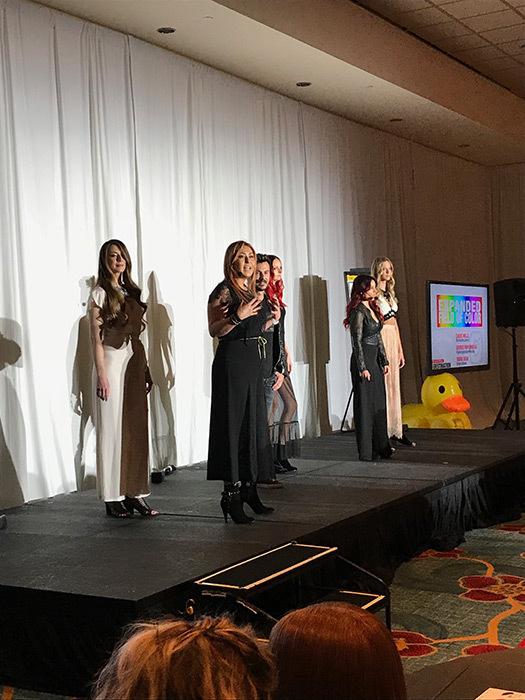 diPietro Todd was on location with 4 colorists in attendance, and our very own talented colorist, Cares Mills on stage representing Matrix as a their Artistic Designer, and Color Master. It was a well-organized, high-energy, super fun weekend. Here’s what we learned. 1) Matrix people LOVE Matrix, and I mean, obsessed. Every single person donning a red Matrix t-shirt was so welcoming and enthusiastic about the brand. It was infectious and seemed so genuine. They support one another, and really want to share their gift with fellow hair people. At diPietro Todd we can totally relate to this, as we often feel more like family than co-workers, and education and sharing knowledge is a founding principle of our salon. Their team really made these classes fun and we all instantly felt like part of the tribe. 2) Matrix is launching a new line this year called SOCOLOR CULT and it definitely peaked our interest. They have partnered with Fergie (who, by the way, was in attendance at the event this year) to roll out this incredibly vibrant and long-lasting direct dye hair color. 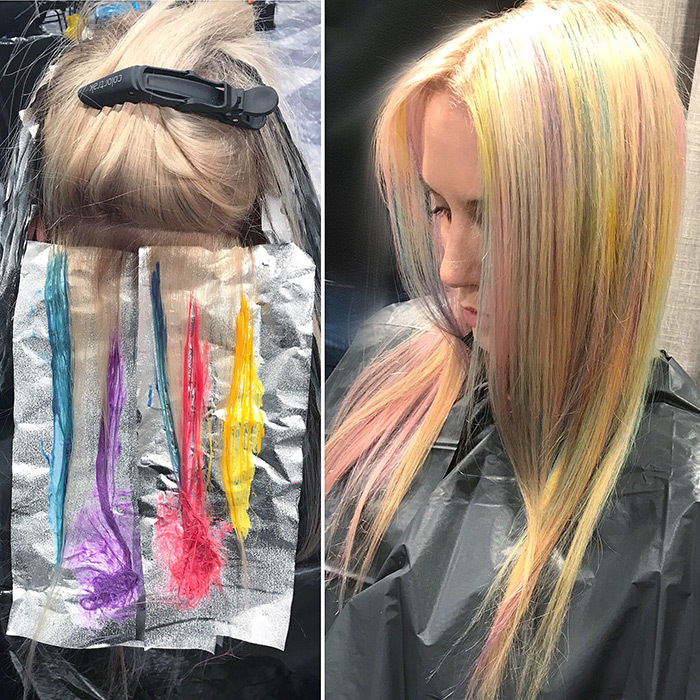 The hues were so fresh and on trend and just beg to create #unicornhair. We were able to play around with the colors during one of the hands-on courses and we were very impressed with what this line could do. During the class they also demoed a new color-removing product that our color nerd brains went crazy for. 3) Social media isn’t going anywhere anytime soon so if you have not already boarded this train then its best you do before it leaves you behind. Instagram is where our business can grow and flourish. It’s a one-stop shop for inspiration, self-promotion, building your individual brand and collaboration. Mary from behindthechair.com made a powerful and impactful speech about the necessity of hashtagging and gramming your story. She showed what images are currently trending and how these images directly inspire celebrity looks. One of the classes we took brought in some Instagram pros to show us how they take and edit their images. The challenges they face in keeping up with technology and how it relates to their business behind the chair was very relatable and gave us all something to chew on once we returned home. 4) Not to diminish what Matrix shared with us during the event, but I think all the hair colorists in attendance from diPietro Todd learned the most from just sharing their perspectives with each other. Although all trained with the same solid foundation, we emerge as colorists with our own unique identity and all approach hair differently. 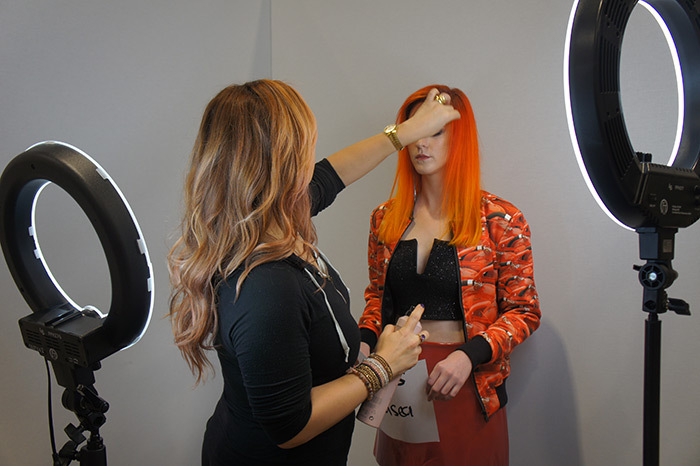 Bobbie, a colorist from our Palo Alto location, shared that she rarely base adjusts clients. This made Phillip, a colorist from Fillmore Street, say “WTF, please elaborate.” Annie, a colorist and educator in Walnut Creek shared that most of the colorists from her location prefer foils to balayage. This blew my mind as I have recently noticed a massive shift in my own clientele switching to hair painting. Annie also encouraged me to use a different lightener than my usual go-to, and a couple weeks later, I am so grateful for that knowledge. These conversations took place on the plane, over lunch, while waiting for room service to arrive and poolside. Going to events like these are so valuable for remembering that a lot can be learned from our fellow dPT neighbor’s backyard and getting together face-to-face is crucial to making these cross pollinations occur.